Tesla plans a massive expansion of its supercharger network, making a coast-to-coast trip in a Tesla all-electric car possible in the near future. Tesla will be tripling the number of its supercharger stations by the end of June, and by the end of the year, its expansion program will allow Tesla drivers to go from Los Angeles to New York, according to CEO Elon Musk. Musk said that the expansion of the network of superchargers, which allow the company's cars to be recharged in about an hour, will cover most major metropolitan areas in the United States and southern Canada. While owners can charge the car using ordinary electrical current at home overnight, the supercharging stations are important for relieving drivers' anxiety about running out of power and being stranded on long journeys. Check out what makes the Tesla Model S different from gas-powered cars. "It is very important to address this issue of long-distance travel," he said. "When people buy a car, they're also buying a sense of freedom, the ability to go anywhere they want and not feel fettered." The ability to use the high-speed charging system is standard on higher-priced Tesla models and optional on lower-priced cars. There is no fee to use the system for Tesla owners. Musk and the New York Times got into a dispute early this year when the paper's review of the Model S claimed it ran out of power while trying to drive from Washington to Boston using the supercharger network. 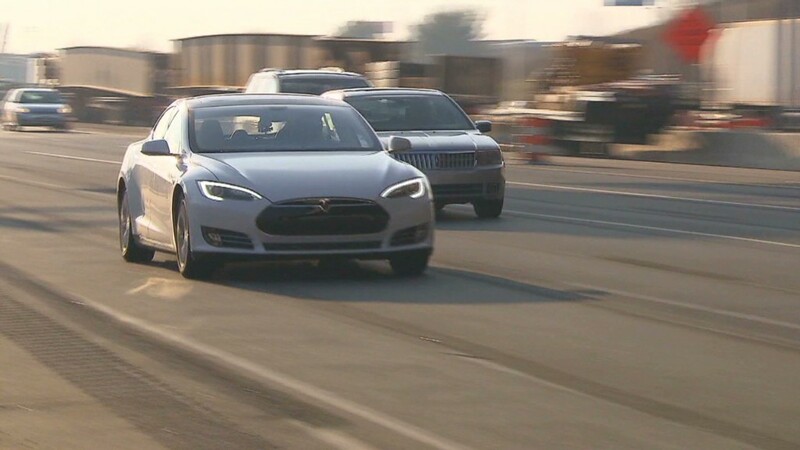 Musk responded by saying data from the test drive showed the Times reviewer did a number of things to deliberately cause the car to run out of power. Musk also announced that Tesla is working on improvements to the supercharger technology to allow Model S cars to get three hours of driving time from a supercharger station in just 20 minutes. That system is currently in "beta test" said Musk. Musk said he plans to take a road trip from Los Angeles to New York in a Model S with his five children to prove the efficacy of the expanded supercharger system. The Model S can seat seven with a pair of rear-facing children's seats in the hatchback cargo area.